At the moment I am reading a very well researched novel of the life of Queen Emma, a Saxon Queen who hailed from Normandy but married the very arogent English king Aethelred. At the age of 13 poor girl. However she came into her own and became the wife of two kings and the Mother of two kings. Helen Hollick labels every chapter with date and place, and does not wander too far from the facts while weaving a good story between. I have only got halfway or so through the 800 odd pages, but it seems a good read, it was just one I picked up by chance at the library. What is the name of the book Gran? It sounds interesting and 800 pages is about the size I like them! Some of my best reads have been picked up in libraries or second hand shops, books that I would not normally pick if paying full price in a bookshop. I'm currently struggling through Bring Up the Bodies and finding it tedious, so may chuck it if it doesn't improve soon. Wolf Hall was trial of patience too, I really am disliking the way this woman writes. Oh, ID - what can I say? It is a very stilted style, I thought. Got both for christmas as I hadn't read them and found them also, much to my disappointment, harder going than I'd hoped. Good, but unnecessarily clever here and there - expecially at points in the story when one really just wants to know what the bloody hell has happened, not what the character then charged with delivering the data thinks metaphysically about the weather or whatnot. But they're consistent in style - I'll give Hilary that. So once you settle in to it the ride becomes less bumpy. I want to read these, but everything people write about them make them sound a little daunting, though excellent and worth the bother. I feel they would take me forever. Thanks Gran, I shall look it up when next ordering from Amazon. Unnecessarily clever, yes Nordmann that is a good description. The friend who lent the books left them with two comments, that they were her very favourite books of all time and that she'll definitely be re-reading them. Oh ho, me thinks I better not drop them in the bath! And that Wolf Hall was difficult to get into because Mantel simply uses 'he' when referring to Cromwell, which can be confusing. But apparently because there were complaints about this she amended the affectation in Bring Up the Bodies and is much easier to read as a result. I had such high expectations and was much looking forward to these books. The era is fascinating but the delivery, I'm afraid, is waffley, pretentious and merely confuses a complicated story line that already has many players. Mantel is a little too sympathetic to Cromwell also, in attemping to add balance to his reputation I feel she has over cooked it a bit. No need to despair yet again Temp, not everyone can be expected to enjoy the same things. That would be too boring by half. Waffley is not what I was getting at regarding Mantel - some of the prose is sublime. My objection was purely that there is much in the story which presumes prior knowledge on behalf of the reader concerning the events in question. It's fictional history written for people with a thorough knowledge of the actual history (and doesn't disappoint in that respect), which in itself is to the Philippa Gregory ilk what Gibbon's "Decline and Fall" is to "Asterix in Switzerland", so not a grievous fault by any means. Gran, I read Hollick's book last year and also enjoyed it - though her depiction of Knut is cringeworthily two-dimensional. In fact I've yet to read any attempt at portraying that complex man with any great understanding outside of Norwegian (there is a very different take on that family here), so she can be forgiven I suppose. Her main character Emma is however a very well drawn and credible portrait of a person of her time, even if some of the events and minor characters around her are less so. Oh waffley is my description, not yours Nordmann. The book is more about Mantel's ability with words which rather over shaddows the story and the history, it is not what I personally enjoy in a book. For me, a good writer takes a back seat and the story takes over, rather in the same way a good actor brings forth a character that makes you forget there is an actor there at all. I can see this straying into the what is art topic, or in this case, what is literature? Or "Why is Asterix still better than anything Philippa Gregory has written?" A good read I've enjoyed in the recent past was "Pure" by Andrew Miller. I'd avoided it because it won awards (not always a good sign) but was surprised at how engrossing it quickly became. It's essentially the story of a young engineer's dilemma between his enlightenment ideals and his love of history and tradition, not a problem unique to the era in which it is set, France just before the Revolution. Miller's recreation of Paris at the time is masterly. Maybe sometime Nordman you could give us the Nowegian take on Knuts family, did he not kill his Brother? Ellen I think would have been a rival for Eleanor if there had been more information available about her. She aparently had no great love for the two children she bore for Aethelred. In our library Harold the King by Helen Hollicks has stared me in the face for years, but I avoided it, thinking it might be just a sort of romantic take on Harold and the events surrounding him. Maybe I should try it, but I don't think the library has The Hollow Crown, though it does have something else by her. Speaking of Paris have any of you read The Piano Shop on the Left Bank by T Carhart? It is a delightful sort of memoir but totally focussed on pianos, rather than the writer. Their history, the Parisian people dealing with them (and their very eccentric attitudes to selling - he wasn't welcome in the shop till he came with a reference), the individual tones of them, their structure, their tuning, their makers. A really lovely book. I am still sunk in cosmic gloom after reading what you have said about my heroine. "Woffley", "pretentious", "stilted", "metaphysical ramblings". I am preparing myself for a calm and dignified reply on our Hilary's behalf, but I am not quite ready yet. I am going to Sainsbury's instead, and I may be gone some time. I'm very interested to read your reply Temp. The doning of the mantle of Mantel? And I'm sure Sainsbury's will be more entertaining than my waffle! I can assure you it wasn't, ID. No interesting or amusing incidents seem to happen there anymore, not even in the muesli aisle. I don't know why I responded the way I did to your criticisms of Mantel. You must have touched a nerve somewhere. Certainly she is not everyone's favourite (several of my friends think she is "weird" and that I am even weirder for liking her so much). But she *is* a heroine of mine - I think she is a remarkable writer, and you have to admit that her research for her historical stuff is meticulous. My one claim to fame is that (as I have told you all repeatedly - yawn) I have met her, albeit very briefly in a lavatory. We had a little chat about "Wolf Hall", and she was very kind and courteous to me, even though I told her that I thought (as you do) that she had been far too generous in her assessment of Cromwell's character. I also told her I thought she'd been unfair on poor old Thomas More just because he was a Catholic. She laughed at that. Donning Mantel's mantle, eh? In my dreams, although I can certainly do the pretentious woffle bit on demand. I'm reading Susan Doran's book about Elizabeth I at the moment - it's not fiction though. But it's making me realise that everything I've thought about that woman to date probably is. The metaphysical musings do not in themselves offend me - in fact I quite like when Hilary goes off on such a tangent while exploring someone's head. I just get annoyed when they happen just as I suddenly feel the need to pick up a Tudor newspaper to find out just what is going on in the world that is so obviously affecting the metaphysicists at that juncture! Abstraction is all very well in its place - especially in Thomas More's place - but there are times when a simple news summary at the top of the chapter might not have gone amiss. It's my own fault of course. Having watched the entire "Tudors" TV series you would think I should be up to speed on everything that happened in the period. I am surprised that you, of all people, should imagine that a grasp of the Tudor period comes from a cursory viewing of "The Tudors". You need "The Tudors Box Set Complete Series" which you should watch at least three times (Series 3 - the most challenging series - perhaps four times)! Apologies, Gran, back to your topic. I borrowed two books from the library yesterday which I hope will prove to be "good reads". One looks a bit daunting; it is Stephen Alford's biography of Burghley; the other is also a biography, "The Lady Penelope: the Lost Tale of Love and Politics in the Court of Elizabeth I". It is about Lady Penelope Devereux. I know very little about Lady Penelope - or "Poor Penny Rich" as she was later called - only that she was the controversial and very beautiful sister of Robert Devereux, Elizabeth's favourite. Lady P. is traditionally thought to have been the inspiration for Sir Philip Sidney's "Stella". Apparently she had an interesting and unusual life, but she died in disgrace, described as "an harlot, adulteress, concubine and whore." That probably means she was intelligent and had a mind of her own! I'm about to start it now (after some 1706 tea): I seem to do most of my reading these days very early in the morning! Here's a picture of her - on the cover of my book. She has a strangely modern look about her, I think! I do not wish to stem the flow of this interesting theme but several thoughts occur. The first is being in awe of whomsoever actually chose a book to gift to nordmann - brave soul. my other observation is that you all seem to have better stocked libraries than I have access to here. Ours is well used in the sense that it is warm so many oldies sit in most of the day and read a spread of dailies. The open plan section allows play group nannies to herd in toddlers and sit and chat whilst the small fry mess about with books. Another section is given off to local artist display - and sales. The book section has tables of unread books for sale, there are many computers - used by many chinese looking people who, I assume, keep in touch with buddies in the home grown 'grass' trade that flourishes in our rural area houses and barns.... when one lot went up in flames a second fire brigade had to come as the first lot were made far too happy on the fumes. I digress. Of readable books there are few, so envy your haul this week. back to the main thread, with apologies. P.
Our local library is much like your Priscilla, but I very rarely actually pick a book off the shelf, apart from the reserved shelf. I always order on line we have access to heaven knows how many millions of books around the city, and they send me an email when it arrives. A very good system. I get to stay only mimimum time with the screaming kids.Those were the days when you had to be quiet in the library! David Tennant as Richard II too. One's cup runneth over. My Lady Penelope book is excellent. I had no idea the Devereux offspring had so much royal blood in them. On the paternal side they could claim descent from *four* of the sons of Edward III. Varlow also argues that Henry VIII was their great grandfather (she believes the Boleyn/Carey progeny, Katherine and Henry, were little Tudor bastards. Katherine Carey, daughter of the other Boleyn girl, was the grandmother of Penelope and Robert Devereux and their numerous siblings). The family trees - four of them - at the back of the book are absolutely fascinating. The family networking system was amazing. No wonder Elizabeth was so neurotic about marriages. Robert Devereux, Earl of Essex, the son of the She-wolf Lettice Knollys, was - thanks to his pa - actually more royal than Elizabeth. No wonder too that the queen kept a very wary eye on him - and on the other members of those much intermarried old families. And no wonder Devereux despised the parvenu Cecils so much. The "old nobility" did not - as I have previously thought - go down without a fight. 90% of us are supposed to be descended from Edward III, well you never know do you. My new read is "The Chosen King" 579 pages which is the follow on by Hellen Hollick to "A Hollow Crown" I was interested because I only have a vague idea of how Harold followed Edward. This is another good read. By the way Temp, I await with interest the third Cromwell book by Mantel, should be a scorcher. I believe Mantel has also written books about Chechnia, but I have not read any of them. Hi Gran. Have you read "A Place of Greater Safety" - Mantel's take on the French Revolution? I'm about to start it. As yet Temp I have not heard of "A Place of Greater Safety" maybe you can let us know what you thought of it when you have had a go. Ah - rigour and perseverance - two excellent qualities, to be encouraged and applauded both in the (amateur) historian and in the student of good literature. Nothing like a spot of wrestling with a hefty bit of prose. "The rigour of the game". Charles Lamb. But he was talking about whist. Finding the two in combination is devilishly difficult, I agree. Hulk Hogan's reading of "War and Peace" comes close, but the version I bought was abridged down to two minutes and consisted mostly of him goading his opponent Willie "Bone Apart" Napoleoni into a rematch. Now, Hilary "The Heavyweight" Mantel versus Hogan - that would be worth watching! Well, for my money, James "Useless" Joyce's scrap with Marcel "the Wave" Proust was the greatest "I Quit" match ever. I couldn't agree more (with the first bit) - the unfortunate thing was that neither of them chose to quit before they'd started. A godsend to pseuds, the pair of them, for generations afterwards. The late Hilton Edwards related a story once about Joyce concerning a time when the latter was manager of one of Dublin's earliest cinemas, the Volta Cinematograph in Mary Street. Edwards' informant (the Abbey Theatre playwright and manager Lennox Robinson) and a few friends had gone along to see what all the fuss was about. A few reels into the "performance" the screen went white and a strange sound was all that could be heard emanating from the projection room. Not knowing at first if this was part of the theatrical experience (modern art and all that) the audience obediently waited in silence, until after a few minutes it began to sink in that something might have gone awry "ex machina". Robinson, concerned for a fellow theatrical manager's reputation, decided to investigate, left his seat and thrust open the projection room door, only to find the cinema's young administrator/projectionist/box office teller - oblivious to the requirement to change film reels - seated in an armchair and engaged in what one might call the perfection of his mastupratorial technique (later put to such lucrative effect in his writing) while holding a copy of a recent Italian starlet magazine in his free hand, the page open on a pin-up of Ada Dondini or someone "of equal radiance" as Edwards phrased it. I thank Hilton for that image - it has helped me tremendously when assailed by Joycean bores in the past. It took me 2 years to read Ulysses on-and-off (more off than on) and I can honestly say that I still haven't a clue what it is about. Apart from there being a few fascinating snippets regarding life in early 20th century Dublin (snippets which can be gained from many other sources and much easier) there is nothing to recommend it. In fact the various grosser passages in the book (which somewhat understandably raised the eyebrows of the censors at the time) are still today not really 'literary experiences' which one would wish to inflict on other people. I'm pretty much convinced that the overwhelming majority of revellers at 'Bloomsday' events have never actually read Ulysses from start to finish. Well, I have to admit that I was a bit of a James Joyce bore in earlier days (or rather I tried to be). I used to wander about at Manchester Victoria carrying a copy of "The Dubliners", convinced I looked terribly intellectual. But I was very young. These days I'm more likely to be found reading "Hello" magazine at railway stations. I had a friend at college who had a dog called Garryowen, named for the bad-tempered animal in "Ulysses". I remember being terribly impressed by this (at the time). "Finnegans Wake" defeated me utterly. I don't believe anyone has ever read it, not even Richard Ellmann. 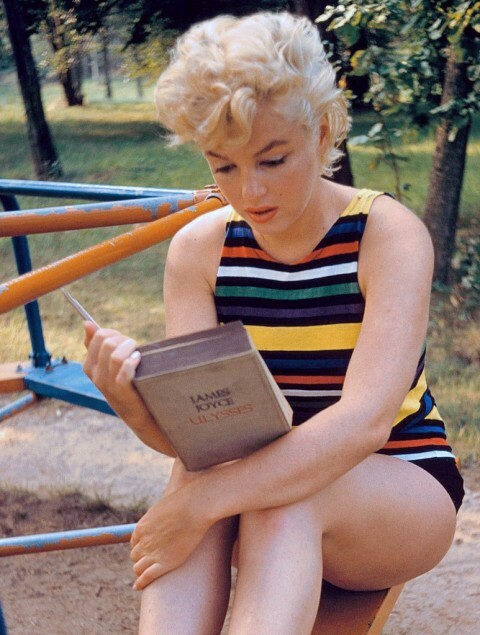 And here's the famous picture of Marilyn Monroe reading "Ulysses" - in a playground. She's reading the glossary - smart lady! American editions always had a glossary that may or may not have "translated" Joyce's gobbledeook correctly. However it pretended to and so, being of the same fraudulent spirit as that in which the story had been written, and with the added bonus of actually helping one get to the end quicker, it was not surprising that the USA produced the first Joycean bores - and still produces a little industry around interpolating his rants. The US publisher attempted the same with Finnegan's Wake but, not surprisingly, with less success. Personally I think he has pulled off one of the longest-running "Emperor's New Clothes" hoaxes in history! All that to say that I had a look in my Dutch-English dictionary for the word "doorworstelen" (door/through and worstelen/wrestle) and what they say...: "struggle through", "wade/plough through", "elbow through"
Have to say I found nothing in English with "wrestling through"...only something like "wade through"
Perhaps "elbow through a crowd" is the nearest to the Dutch "doorworstelen"...? I have finished reading "I am The Chosen King" by Helen Horrick, she is very knowledgable about the period before and after William the first took over. It appears that Harold Godwinson suffered from the same problem as R3. his story was told by his conquerer. England at that time was a very well run country and every area had been registered and noted, so William was able to get the Domesday book written very speedily, the work had all been done by his predecessors. William refers to Harold as Earl Harold in the book. The battles in the North against Harolds Brother Tostig, and then the race down through the country to confront William, was unbelievable. This author is very good at describing a battle, something like Bernard Cornwell. There I was waiting for the arrow in the eye, then read that that was not what happened at all, as I said like Richard III. Harold II was the last English King. Actually Edgar Atheling was declared king after Harold II so could be considered the 'last English king'. However, a lot of other kings of England would have considered themselves as English. After all what makes a king or queen English or non-English? 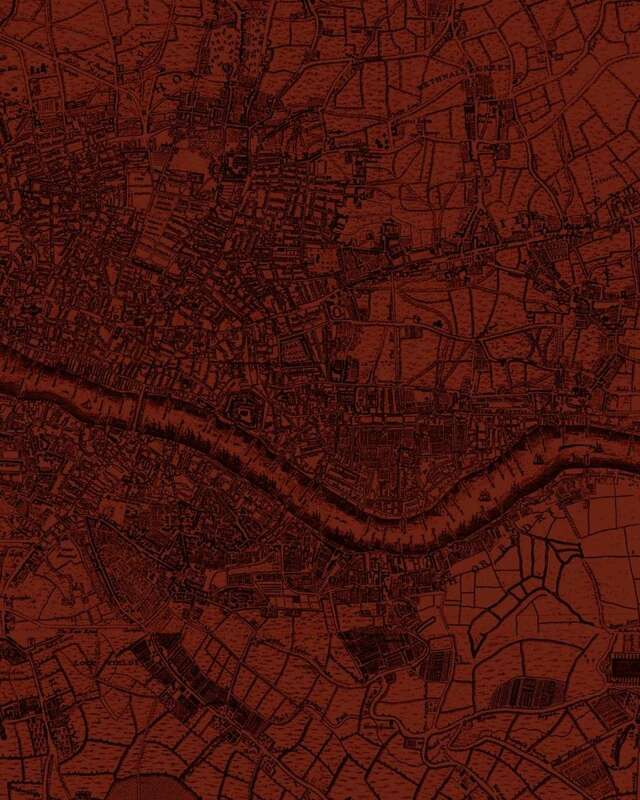 With regard to Harold II, the question must always be as to why did he not remain in London and gather his strength and force William, who had remained on the coast, to come to him? Harold's decision to go and fight at Sandlake proved a total disaster for him, the house of Godwin and the whole of England! There are several claimants to the title 'last English king' ranging from Harold II to Richard III to Edward VI to James II etc. As Tim says, however, this all depends upon one's definition of the word 'English'. William III (although not born in England) was, nevertheless, a descendant of King Edmund I. So too was his cousin and sister-in-law Anne (who was born in England) and who succeeded him and was the last Queen of England. Queen Anne, on ascernding the throne, specifically stated that she was English. Hi Tim, I wonder if the author was refering to the fact that every King after William would have descended from the conquerer irrespective of where they were born? I am not convinced Gran, all monarchs after William I were also descended from Alfred the Great. More than likely it won't be a good read but I heard this morning on the Beeb radio that Dan Brown has a new book out. This one apparently based on Dante's epic poem, the mind boggles as to where he'll run with this one. ..... Dan Brown has a new book out. This one apparently based on Dante's epic poem, the mind boggles as to where he'll run with this one. .... probably, royalties in hand, straight to the nearest branch of his bank! can't go wrong with Pratchett. What book(s) is everyone else reading? Well finally I've followed the general trend and ordered 'Wolf Hall' and 'Bring Up The Bodies'. BUTB arrived today but even when WH arrives I'll try and resist reading them ... too much to do in summer, so I'll probaby put them both straight into my Christmas box. By the way Trike I've been meaning to thank you ... one of your Youtube postings led me onto the BBC's 'Victorian Farm', then 'Edwardian Farm', 'Wartime Farm', and 'Tudor Christmas'. They're absolutely brilliant, luv 'em all. But I have to be careful to ration myself to just one episode a night otherwise I'd get nothing done. I'm currently working through 'Tales from the Green Valley', which just leaves 'Victorian Pharmacy' to go. So many thanks again for inadvertently showing me the way to all those gems! EDIT : Also, forgot to add, I'm glad to see that Terry Pratchet is still writing and being published. Just for the popularisation of science he's deserves a medal .... but his books are also so funny, qwerky and clever too. Long may he hang in there and keep writing! I have been reading Wolf Hall slowly and enjoying it lots. But it has been put aside briefly while I dip into the beautiful book from a local woman, which has her father's war diaries on one side and on the other (a tete beche book I think it is called) an account of her and her husband's trip in 2010 following in the footsteps of the 2 NZEF (specifically her father's and his uncle's). 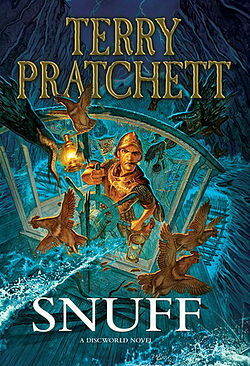 My husband is almost finished Snuff, which he bought not long ago - a very rare occurance for him, but he does like Terry Pratchett's writing. Recently on a books messageboard someone posted a link of huge praise, comparing him (a little exaggeratedly, I felt) to Shakespeare and saying he would still be read in 100 years when lots of our present adulated and respected writers would be forgotten. None of us will be around to know if he is right or not (unless the present concern of politicians and doctors to ensure we are never allowed to die comes to pass literally). PS I have also begun (and it won't take long to end - very clear easy writing) The Widow's Tale by Mick Jackson. I very much liked some years ago his book on the Duke of Portland (I think it was him/he) The Underground Man but from memory that book was more intricate.